In the previous chapter we have learnt about C Programming Expressions, in this chapter we will be learning about L-Value of Expression. What is L-Value of Expression ? Variable is the only container in C programming thus L Value must be any Variable. 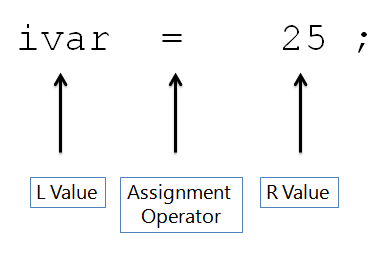 In the above expression, Constant value 5 is being assigned to a variable ‘num’. Variable ‘num’ is called as storage region’s , ‘num’ can considered as LValue of an expression. Below are some of the tips which are useful to make your concept about L-Value of Expression more clear. You cannot assign the value or any constant value to another constant value because meaning of constant is already defined and it cannot be modified. Even we cannot assign a value to a constant variable. Constant variable should not be used as L Value. We know that macros gets expanded before processing source code by compiler. All the macros will be replaced by defined value using pre-processor before compiling program. Inside if statement , if we try to write comparison operator as “= =” instead of “==”, then we will get this error. Always try to assign constant value to “Variable“. If you are using comparison operator then we don’t provide space in between operators. In the next chapter we will be learning RValue of an expression which is also called as right value of an expression.